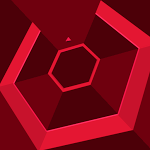 Terry Cavanagh, the mind behind VVVVVV and Don't Look Back, brought Super Hexagon – a game already lauded among iOS, Mac, and Windows users – to Android, with its minimalistic, addictive gameplay intact. The game, for those who don't know, is about as minimal as it gets – you control a small triangle on the outside of a central hexagon. In sync with a groovy beat, walls will quickly flood in.